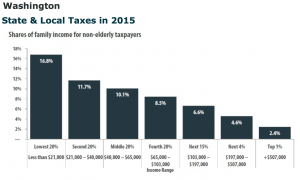 Washington State consistently wins the award for the #1 regressive tax system in the U.S. That means that the burden of state and local taxes falls heaviest on the poorest. Add to that our state’s generous corporate tax breaks and loopholes (Boeing, anyone? ), and it’s not hard to see why our state can’t adequately fund basic services like education, mental health, shelter and affordable housing – and transit. Wringing pennies out of the poor isn’t just unfair, it’s a strategy to starve our public infrastructure. 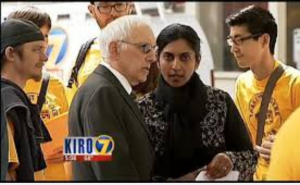 In 2014, TRU rallies for an Employee Hours Tax with councilmembers Nick Licata and Kshama Sawant. Public transit gets very little funding from our state government. Instead we rely on “local options” – taxes that a city, county, or Transportation Benefit District (such as Sound Transit) collects from its residents. The problem is, these options have to be authorized by the state legislature, and most of the ones we have available are extremely regressive, like sales tax and flat car tab fees. Others, like property tax and Motor Vehicle Excise Tax (which is based on the value of one’s vehicle) aren’t quite as bad, but they’re still more regressive than a progressive income tax or taxes on big business. So again and again we’re faced with the choice: cuts to public transit, or more regressive taxes? 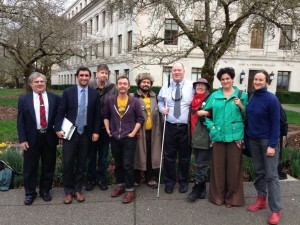 TRU members in Olympia with Rep. Brady Walkinshaw for a hearing on HB 2186, for a Non-Residential Parking Tax. For several years TRU has been pushing Seattle, King County, and Sound Transit to use their most progressive funding option for public transit: the Employee Hours Tax or Employer Tax, which would require businesses to pay a modest amount based on the size of their workforce. We’ve also worked with state legislators on two bills for more progressive local options, such as a Non-Residential Parking Tax that would require the owners of parking lots like those at big box stores to contribute to transportation funding. With anti-tax ideologues controlling the state senate, nothing has passed yet, but we will keep up the pressure till we win! 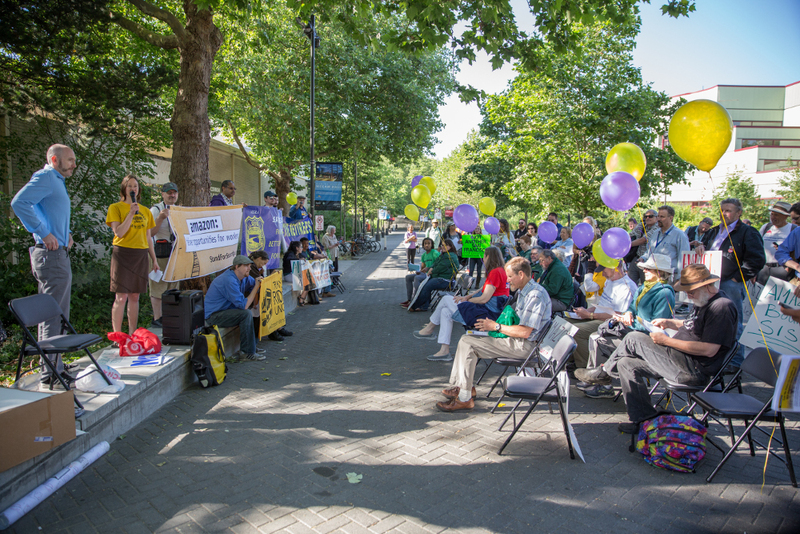 While Amazon shareholders met inside, we held our own People’s Stakeholder Meeting outside. The fact is, big corporations in our region depend on public infrastructure and services like transit, which gets their workers to work and reduces traffic congestion so the wheels of commerce can turn. They are making huge profits from operating here, without paying their fair share to sustain the public sphere. TRU has worked with allies to put pressure on big corporations like Amazon to be a better neighbor, and to respect the rights of their workers as well as contributing more to fund public goods and services. Winning this fight is going to require a movement!